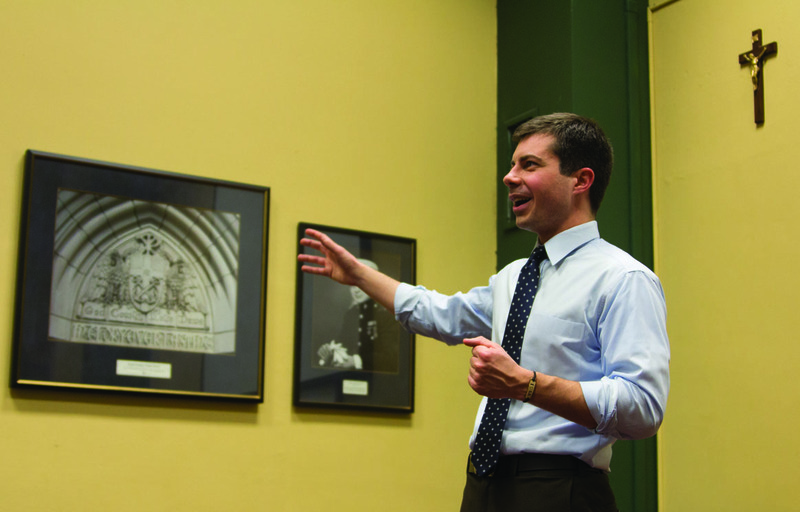 South Bend Mayor Pete Buttigieg spoke to College Democrats on Sunday about his career, the relationship between the city and Notre Dame and his hopes for the future. Buttigieg said he is excited to be South Bend’s Mayor during such a monumental time in the history of the city. Although he acknowledges the hardships the community has faced in the past, Buttigieg said he believes his election as a 29 year-old was a message from the community to look toward the future. Despite his age, Buttigieg said he ran for mayor because he believed he had experience, which prepared him to be a better agent of positive change for the city than those who were currently in municipal leadership. “I had a business background so I was a little more familiar with the nuts and bolts of that side, and I felt I could get something done,” he said. “I also focused on the relationship I had with the city. I had grown up here. I left, and I found myself with others that were from the city. The city is beginning to believe in itself again, Buttigieg said, and part of that is a function of an improved relationship with the University. Buttigieg said he sees the city level as the most dynamic and fun level of government, and the state of the current national government makes it the level in which one is most likely to be able to improve things. Buttigieg said his experience serving in Afghanistan from February to September of last year as a member of the U.S. Naval Reserves helped him in his career and gave him a new perspective on cities and those that work hard to support them. The nature of his job as mayor has allowed him to bypass party lines and work for the good of everyone in the community, Buttigieg said. While city members may not agree on all of his perspectives, Buttigieg said cohesion is present on the local level. “I work with people that would never support me for national office, but they see things exactly the way I do when it comes to local problems and how we’re going to try and fix them,” he said.